I showed you a peek in my last post. During the hub bub of summer, a friend had a new grandbaby. I wanted to make something for her. I pulled out a tried and true pattern. 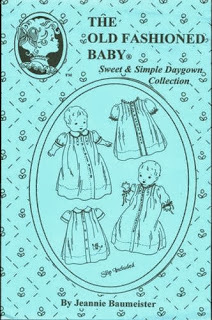 Sweet and Simple Daygown Collection from The Old Fashioned Baby. I knew I wouldn't have to worry about construction or fit. The only change I made is reducing the hem to an inch instead of the called for two inches. I stitched just some simple sweet embroidery that is included in the pattern. 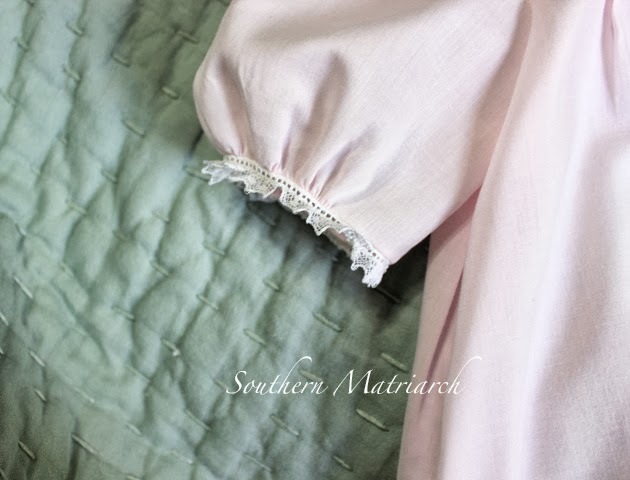 A sweet baby edging attached with entreduex to the three quarter length sleeves. Finished off with some antique mother of pearl buttons, also from The Old Fashioned Baby. The gown is made from easy care Imperial Batiste. This new momma is in the throes of moving as well as having a two year old. I am not sure she can find her iron packed away in a box. So wash and wear poly/cotton was called for. Excuse this awful, off center picture. I almost forgot to take pictures. I am thinking about Halloween and Christmas around here. Even doing some Easter planning. Don't curse me, as the number of grands grows, more planning is needed. What are you working on faithful reader? 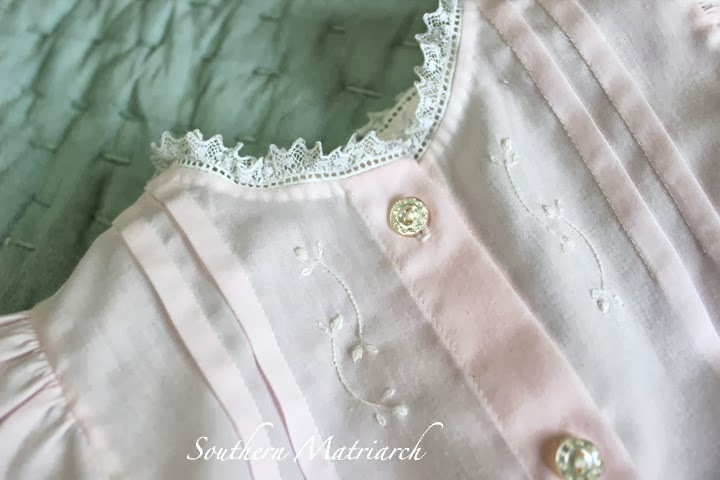 The daygown is beautiful and indeed very pretty in pink. It is nice to know about your changes to the pattern. 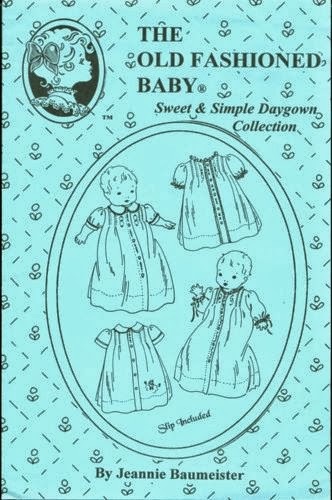 I am new to smocking and just created my first bonnet. If you get a chance please come visit and see it. Of all the needlework I have done over the years, this seems to touch my heart the most. Thank you for all your inspiration. I have a question. I am wondering about interfacing the area that is to be smocked. 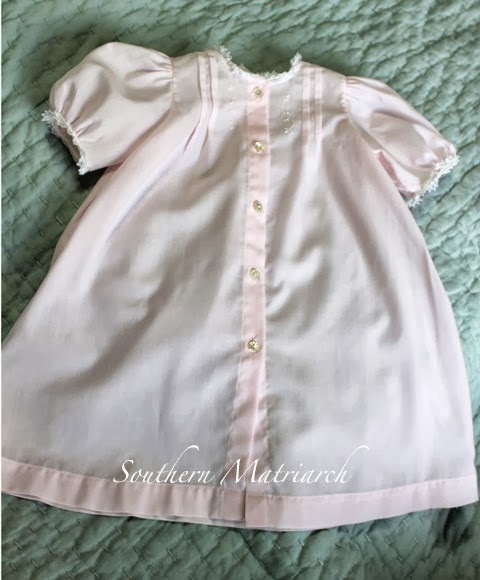 As you know I am new to smocking and want to learn the correct way. 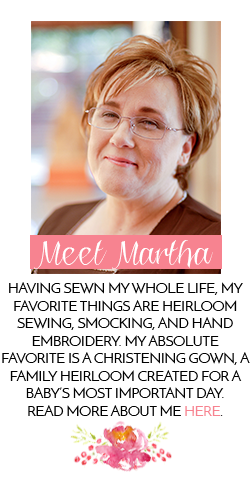 What fabrics need the Lightweight German interfacing added before pleating?